In keeping with my "healthier eating theme", I decided to go with a light New York style cheesecake. 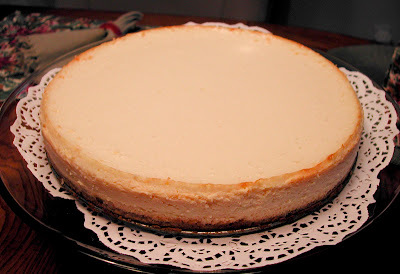 And who would know how to make the "best" light NY style cheesecake? America's Test Kitchen of course! I do not own the America's Test Kitchens Best Light Recipe cookbook, but I did see this recipe on their tv show on PBS. I usually save the shows that I like on my DVR so that I can go back and watch them over when I want to make something, but this time no such luck. I had to search the internet for the recipe and finally found it. I don't feel right to post the original recipe since I don't own the cookbook (even though you can find it just like I did) but I will tell you about some revisions that I made. If you are a fan of America's Test Kitchen, you are probably wondering why I would make revisions to a very well tested recipe. 1. I do not own a 9" springform pan which the recipe calls for. I have a 10" pan and I was afraid that if I followed the recipe exactly and used the wrong size pan, something was bound to go wrong. 2. I decided to make this at the last minute and didn't have time to make their version of yogurt cheese which takes 10-12 hours. 3. I wanted to flavor the cheesecake with my own personal touches. Also the size of the pan affected the cooking time. It was done in 1 hour and 15 minutes. 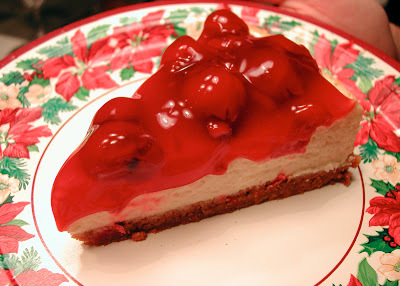 By the way, the cheesecake turned out really well, everyone loved it and I will definately use this recipe again! This looks great, I remember watching the episode on tv where they made it. I was under the impression that Greek yogurt and yogurt cheese were basically the same thing; if you strain regular yogurt, you get yogurt cheese. Greek yogurt is already strained, so you get to skip that step. Am I wrong? I'm afraid you did more work than you needed to! 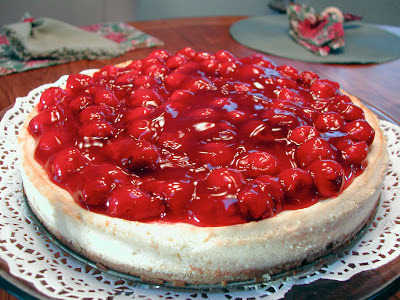 The cheesecake looks and sounds delish! Kim, great question. I strained the greek yogurt because the yogurt cheese really needs to be thick. Since I started with 12 ounces of yogurt, straining it for 3-4 hours let out just enough liquid to give me just a tad over 1 cup. Thus making it more like "cheese" than yogurt. Never seen a prettier cheesecake! Looks amazing. Holy moly! That looks amazing.